After several years in Georgia I noticed that the more integrated I became, the less I remembered how it felt like to prepare my first trip to here. I started forgetting that some readers have never been to Georgia at all, therefore have no idea, what to expect and what to be ready for. I beg your pardon and launch a series of posts about basic tourist things. Georgia is not the most conservative country in the world. Rather vice versa: it is open to visitors. The Georgians, looking sometimes quite grumpy, will treat you with kindness and understanding, if you are lost, tired or hungry. However, like in any other country, there are some cultural and routine-related peculiarities I want to tell more about. Let’s start with the transport issues. Please read, ask your questions and share the information with your friends! – Taxi. Private or airport taxis are available any time. Seeing a non-Georgian face, the drivers, of course, try to take the maximal amount from you, but there is a table of tariffs written at the taxi stands: Old Town – 25 GEL, more remote, but still central areas like Vake and Saburtalo – 30 GEL, and then more. When taking a taxi in the city, remember that trip inside of city center costs 4-5 GEL, from the center to Vake, Saburtalo, Avlabari – 5-6 GEL, to more remote areas – around 7-8. Though, to me, the most convenient way to travel with taxi is the app Taxify. The prices and level of service beats the other providers such as Taxi Maxim etc. I definitely recommend this! Intercity taxi is something more expensive. If you want to go to Stepantsminda (Kazbegi), Mtskheta, Gori, Kutaisi, Borjomi, Batumi etc., you can go to the Didube bus station, and look for a shared taxi and travel to the site. Many tourists simply divide the amount for the taxi and have a little cheaper ride with greater comfort. Also, I can recommend a reliable travel service GoTrip – I use it myself when I have really small group of guests to drive around. Buses to Kakheti (Kvareli, Lagodekhi, Telavi, Sighnaghi) – from Ortachala, Isani and Navtlughi (the station near Samgori metro). Buses to Mestia depart from Central Station (please go there in advance to specify the time: it is seasonal!). There are two bus services from Tbilisi to Kutaisi airport: OmniBus and Georgian Bus. – Bus. Bus number 37 runs from the airport to the train station through the city center 24/7. The fare is only 50 tetri (0.5 lari), but the way will take more time than a taxi ride. However, if you have no reason to rush, and want to save money – that’s the best option. What else you should know about the city buses in Tbilisi: the fares are paid either by stuffing coins in a special box (the ticket should be kept till the end of the trip), or by plastic card. You can buy a card only in metro, so if you are traveling by bus directly from the airport, it is advisable to exchange some money, and give the smallest available note to the driver, who will help with giving change. Metro: as I said, you can purchase a plastic card for 2 GEL at each station (keep the receipt, and you can return the card before you leave). You can top it up directly at the cash desk, or at orange and dark blue terminals throughout the city. As already mentioned, the cost of travel with city buses and metro is 50 tetri, and if you change the station within 1 hour, money is being charged just once. The direction of the buses are indicated right at the stops: electronic boards display the names of the last stop of the routes in Georgian and English, as well as the time to arrival of the bus. There is the official website of Tbilisi Transport Company, but I should also say that Google Maps copes with the best possible routes through the city quite well. In Tbilisi, there are also small yellow buses – marshrutka. Their schedule – so far a mystery for visitors, but you can check this website in order to understand at least the way they move around the city. They are faster and stop on demand. The fare is usually 80 tetri. One of the attractions of the city, the cable car to the fortress Narikala and to Kus Tba (Turtle Lake), is also paid with this card. However, the journey will cost 2.5 GEL. And please don’t confuse the funicular with cable car! The funicular goes up to Mount Mtatsminda with the TV tower and an amusement park on top. A card for the funicular and the park should be purchased separately at the lower station, which is located on Chonkadze str. The cost of the card is the same: 2 GEL. One way trip will cost 3 GEL, and you can ride the Ferris wheel and other attractions for 3.50 and more. I recommend to see the sunset over Tbilisi from the Ferris wheel! Its cabins are modern, so there is seriously nothing to fear. – From the Central station, the trains depart from Tbilisi to Batumi, Kutaisi, Borjomi, Zugdidi, Yerevan, Baku – in general, the network of passenger trains is quite small. Tickets can be purchased at the box office, PayBoxes that are located around the city, or at www.tickets.railway.ge and www.matarebeli.ge (the page has both Russian and English versions). For purchasing a ticket, your passport data is required! The airport named after King David the Builder is located in several kilometers from Kutaisi, in the settlement Kopitnari. As I already mentioned, bus lines called Georgian Bus and OmniBus are operating between the airport and Tbilisi, Kutaisi and Batumi. Ticket price depends on the direction and starts from 20 GEL. 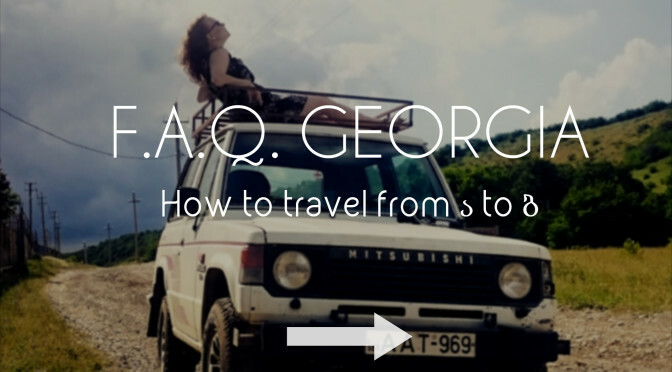 This is the most convenient way to get to the major tourist destinations in Georgia. In order to get to Kutaisi airport, you can buy the tickets online. In Kutaisi people travel by taxi and buses. There is no card system like in Tbilisi, so you have to pay in the old-fashioned way: with the coins. The bus station, from where minibuses and taxis depart towards Borjomi, Tskaltubo, Tsageri, Oni, Ambrolauri, Batumi, Tbilisi and other places, is located near the old McDonalds. Signs showing you the way to the fast food kingdom and transport, are almost all over the city. Batumi Airport is relatively close to the center. A taxi trip to the city takes 10 minutes and costs 10 GEL. Magic of number 10 is followed by the bus number 10, which connects the airport to the city center. However, one way trip will cost 40 tetri. The are some other city buses, but as Batumi is not super big, it is better to choose a bike. Municipal rental Batumvelo offers bikes for 1 GEL/30 minutes, and with a bike you’ll see the whole city and have a beautiful ride along the seaside boulevard. You should buy a card in the information center next to the cable car and top it up with the desired amount. By the way, the cable car is also quite a must – and no cards needed. You just buy a ticket at the box office. To leave from Batumi to the other cities of Georgia, you need to go to the central bus station, or alternatively, to the bus station at the Batumi market. From there, bus and taxis go to different parts of Adjara, as well as to larger cities. However, to go to Tbilisi or to come to Batumi from Tbilisi on something besides the train, I would strongly recommend to take a comfortable MetroBus: departure times are very convenient, there are built-in seat monitors, where you can watch movies and listen to music; coffee, tea and water are served on board… In general, it is much more convenient compared to mini-buses. Buses Batumi – Tbilisi depart from the new bus station at Gogol str. ; Tbilisi – Batumi depart from Ortachala station. There are domestic flights between Tbilisi/Natakhtari and Mestia, Kutaisi and Mestia, Tbilisi and Ambrolauri, Kutaisi and Ambrolauri. You can check the schedule and book the tickets at the website of airline, Vanilla Sky. The prices from Tbilisi are 65 lari, from Kutaisi – 45.